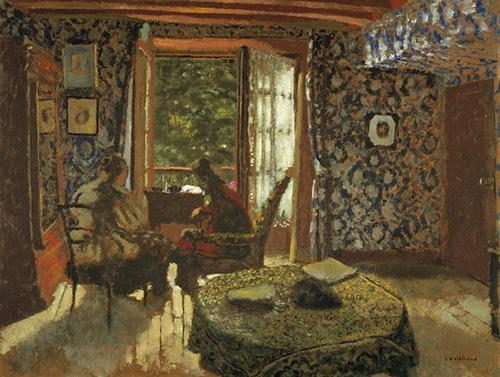 Jean-Édouard Vuillard, French decorator, printmaker and painter, was born in Cuiseaux, France on November 11, 1868. Noted for his paintings showing interior scenes, he was a founding member of the Les Nabis group, a Post-Impressionist group of avant-garde artists in the 1890s that included Maurice Denis, Félix Vallotton, Paul Ranson, Ker-Xavier Roussel and Pierre Bonnard. Also associated with Les Nabis was sculptor Aristide Maillol. Vuillard’s decorative works and paintings often showed gardens, streets and interiors, which were marked with humor. He preferred to paint domestic and interior scenes characterized by a subtle range of blurred, soft colors. He lived with his mother who was a dressmaker, which had influenced his decorative style that often showed intricate, complex and elaborate patterns. While the Les Nabis were anti-utilitarian and created art for art’s sake, Vuillard painted large-scale murals and screens that were architectural in concept, which were mostly used to decorate the interiors of many homes. From 1886 to 1888, Vuillard took art lessons from Parisian schools École des Beaux-Arts and Académie Julian and became part of the Les Nabis in 1889. The group drew inspiration from the works of Paul Gauguin during his Pont-Aven period, when he had a naturalistic rather than symbolic approach to color, applying paint flatly. They also got inspired by the Japanese woodcuts (Ukiyo-e) that were trending in Europe at that time. This caused the group to use firm contours and uncomplicated shapes. 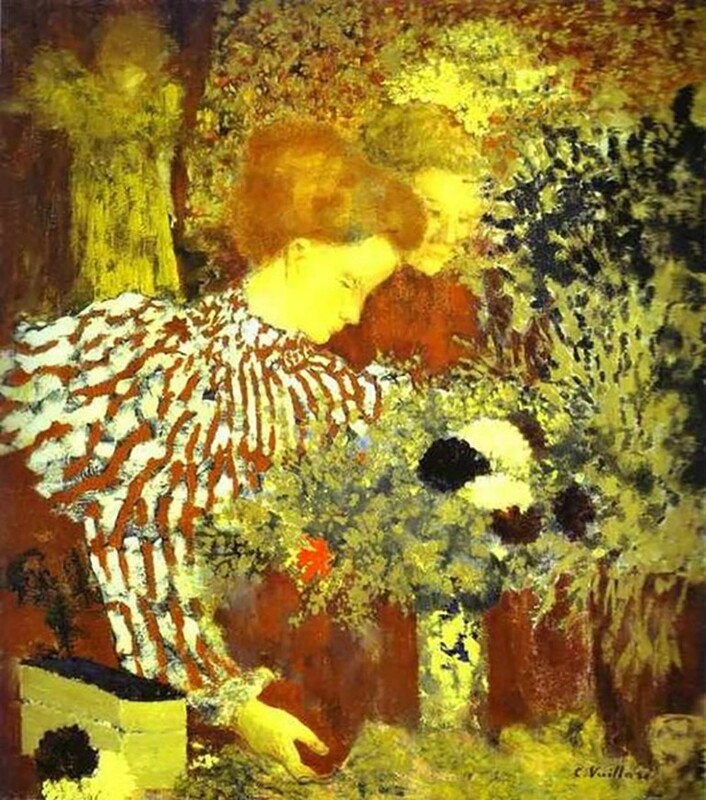 An example of Vuillard’s mature works is called “Public Gardens” that he painted in 1894. This work is a series of nine vertical panels, which was commissioned to decorate a private residence. The panels depicted women and children enjoying the Parisian public gardens. In specific areas of the panels, Vuillard applied patterned colors using soft shades of brown, blue and green to create a tapestry-like, two-dimensional effect. Like most of the Nabis, he was also active in the creation of designs for the theater, poster designs and book illustration. He illustrated the programs and designed the stage sets for the Aurélien Lugné-Poë’s Théâtre de l’Oeuvre, which he helped establish in 1893. Symbolist plays were produced by the theater. The last time that the Les Nabis exhibited their works together was in 1899. He started a more naturalistic style of painting at that time. He also created two series of lithographs that revealed how influential the Japanese woodcuts were to his art. Private patrons and public buildings continued to give his several commissions for decorative works and portraits. He also did several portraits of his friends, Aristide Maillol, Denis, Roussel and Bonnard, showing them working in his studio. During this period of his career, some of his most notable public paintings were the murals in the League of Nations in Geneva which he did in 1939, the 1937 murals he painted for the Palais de Chaillot and the 1913 decorations he did for the Théâtre des Champs-Élysées’ foyer. Together with Bonnard, Vuillard was also regarded as an Intimist because of his preference for domestic and intimate interior scenes, which portrayed the immediate activities going on around him that he depicted in a ritualistic and mysterious manner. He retained this sensibility throughout his career, which showed even in his landscapes and portraits. Vuillard’s best works include “Dressmaker’s Studio,” “Mother and Sister of the Artist,” which showed an uncommon balance between studied structure and spontaneity through the delicate manipulation of textures and value relationships. For his other works, some of the best are the illustrations he did for Alexandre Natanson and his lithographs called Paysages et intérieurs.